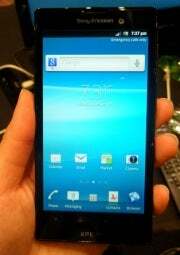 The Sony Xperia Ion ($99 with a new two-year contract on AT&T) is an Android phone with exceptional hardware: It has a 1.5GHz dual-core processor, a 12-megapixel camera, and a massive high-resolution display powered by Sony's own Bravia display engine. But, as we've seen with other smartphones, specs aren't everything. The Ion's clunky software proves that a phone more than just top-of-the-line hardware to be great. One of the main selling points of the Ion is its large 4.6-inch 1280-by-720-resolution display. Dubbed the "HD Reality Display" by Sony, it uses the same image and video rendering engine found on Sony's line of Bravia TVs. The screen packs more pixels per inch than even the Retina display on the iPhone 4S (which has a PPI of 326), and colors on the Ion looked extremely crisp--especially when displaying high-resolution pictures or high-definition video. Unfortunately the beautiful display is extremely difficult to see outdoors; and though the glass is made of a scratch resistant material, I managed to scratch it (accidentally) after just a few days of use. If you decide to buy the Ion, you might want to pick up a few screen protectors, too. Aside from the screen, the Ion looks like countless other Android phones we've reviewed: It comes with a front-facing camera, a rear camera with flash, four navigation buttons (Menu, Home, Back, and Search), a headphone jack, a volume rocker, and a power button. The Ion also includes a MicroHDMI port that you can use to connect the phone to an HDTV, plus a dedicated camera button--a rarity on smartphones these days. The volume rocker and power button felt a bit flimsy to me, and the camera button was too spongy for my taste. One other annoyance is that I often had to make more than two attempts to get the navigation buttons to register input. Commonly I would try to exit an app and find myself hammering away at the Home button, trying to get it to responded. This problem may be fixed in a software update later on, but for now it makes the Ion frustrating to use. I'm accustomed to carrying a Samsung Galaxy Nexus (which, like the Ion, has a 4.6-inch display), so I didn't mind the Ion's size. The phone slid easily into my pocket, and holding it up to my ear to make calls wasn't a chore. Though one of my colleagues complained that the Ion's curved back made it uncomfortable to hold, I had no such issues. Even so, you should try holding the phone to see if you are comfortable with this model's design. The Ion's battery is not removable, but you can reach the SIM and MicroSD card slots by removing a small panel from the back of the device. The Ion packs some wicked specs. The Ion runs on a dual-core 1.5GHz Qualcomm Snapdragon S3 processor with 1GB of RAM. The S3 processor isn't as fast as Qualcomm's S4 line, which powers the HTC One X, but it was more than capable of handling everything I threw at it. Apps opened without a hitch, and HD videos played back smoothly. In general, games ran quite well on the Ion, too. The Ion can connect to AT&T's speedy LTE network, and in less than 10 minutes I successfully downloaded more than 500MB of data to it at our San Francisco offices. Call quality over AT&T's network was fairly solid, though I did notice a distinct hissing noise during all of my calls. Voices on both ends of the call came through clearly, however, despite the hiss. I would have preferred a tad louder default volume from the speaker, but I had no trouble adjusting the volume to a more comfortable level. After about 5 hours of downloading apps over LTE, taking pictures, watching videos, and making calls, I found that the Ion's battery was still at 83 percent capacity. That experience suggests that, with mild use, you should have no problem getting a full day's use from the phone on a single charge. A more precise battery life number, however, must await the phone's completion of our official PCWorld Labs battery test. The Sony Ion also supports near-field communication, and you can use it to read and write information to other devices or tags that are NFC-enabled. The Sony Xperia Ion's Timescape overlay. 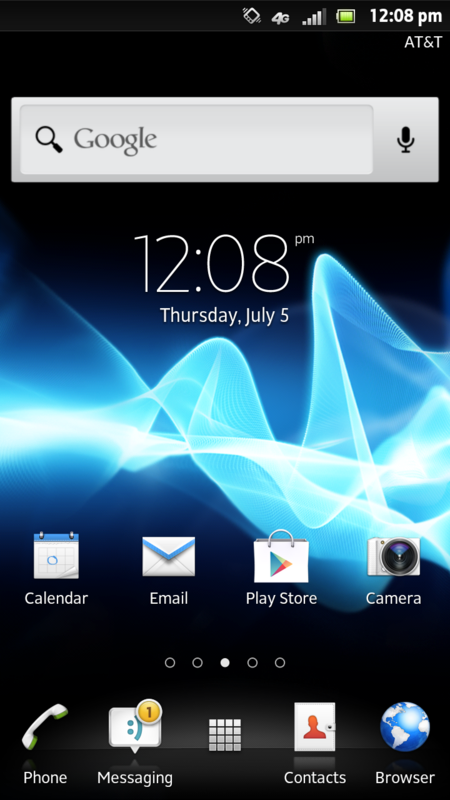 The Ion runs a custom Sony overlay on top of Android 2.3 (Gingerbread), which it calls Timescape. The Timescape overlay looks similar to the one we've seen on previous Xperia phones, though it adds a handful of widgets and tweaks that change the look and feel of Gingerbread to (rather poorly) imitate the holographic UI found in Android 4.0 (Ice Cream Sandwich). The changes include a new app drawer and customizable four-icon dock at the bottom of all five of the overlay's home screens. The Ion was running Gingerbread at CES, and I'm disappointed that, six months after its debut, Sony didn't ship it with Ice Cream Sandwich. According to the documentation accompanying the phone, the Ion is upgradable to Ice Cream Sandwich--but there's no reason why the phone couldn't have shipped with the newer OS in the first place. It doesn't help that the overlay on the Ion makes actions such as rearranging apps and widgets feel clunky and imprecise, or that certain widgets (such as the social widget) look jagged on the phone's high-resolution display. Like most other Android phones, the Ion comes with its share of preinstalled applications (commonly termed "bloatware"), though you can uninstall almost all of them. The Ion is closely tied to the Sony Entertainment Network, allowing you to sign in to your Music and Video Unlimited accounts for access your playlists and movies on the go. In case you don't subscribe to either of those services, or you prefer to save content locally, the Ion comes with 16GB of built-in storage that you can use to your heart's desire. The phone's MicroSD card slot lets you attach an additional 32GB of storage, in case you want to watch the entire new season of Breaking Bad on your phone. If you want to watch TV shows on a larger screen, the Ion allows you to share your content with other DLNA-compatible devices wirelessly. Alternatively, you can use a MicroHDMI cable to connect the Ion to an HDTV, giving you access to a custom launcher where you can play back movies and music, display videos, or open certain applications. When I tried to use DLNA to share a song between the Ion and a PlayStation 3, the two devices took a while to find each other. Plugging the phone directly into the TV via the MicroHDMI cable was much faster and more convenient. Being a Sony phone, the Ion is PlayStation-certified, meaning that you'll be able to download classic PlayStation titles like Crash Bandicoot from the Play Store, and play them on your phone. So far, the library of available PlayStation titles is pretty slim, though Sony seems to be adding new games randomly throughout the year. Sony Xperia Ion: Indoor photo sample. The Ion has two cameras: A 1.3-megapixel front-facing camera and a 12-megapixel camera with flash. The front-facing camera can record in 720p, but the image quality looked comparable to that of the front-facing camera on both the iPad and the iPhone 4S. You probably won't want to use it for anything more than the occasional Google hangout or Facebook self-portrait. Sony Xperia Ion: Outdoor photo sample. The 12-megapixel rear camera is a different beast altogether. I was very pleased with the pictures I took with it: Colors and details looked crisp and vibrant. The Ion's camera app includes many extra features, including a panoramic mode and a mode that detects smiles before it takes a picture. You can also instantly launch the Camera app and take a picture while the device is still sleeping, by holding down the camera button. It's a nice touch--and a great way to ensure that you'll never miss a photo-worthy moment. Though I was a fan of the Ion's picture-taking capabilities, I can't say the same about the phone's video-recording feature. The Ion can record in 1080p, but the test video I shot didn't look very sharp. A distinct jelly effect appeared whenever I moved the phone around, and the onboard microphone was terrible at recording voices. When I played back the footage I shot, voices sounded as though they were coming from inside a distant tin can--definitely not the audio quality you want when capturing precious family moments. The Xperia Ion is a mix of good but poorly implemented ideas. It's a shame that the Ion suffers from nonresponsive navigation buttons and poor video recording. I'm also still bitter that Sony didn't release the phone running Android Ice Cream Sandwich, though I continue to hope that, sometime before the end of the summer, the company will release an update to the OS that addresses the issues I encountered with the handset. But even with those problems, the Ion should satisfy anyone looking for a smartphone to replace their iPod, handheld gaming system, and point-and-shoot camera.